Chelsea boots have been the go-to footwear by many male fashions icons. This types of boots have been popular during the time of John Lennon and Mick Jagger but are still worn by celebrities today such as Kanye West. Chelseas have been around since the Victorian era when Queen Victoria’s shoe maker, Joseph Sparkes-Hall, invented it for the queen. It growingly became a popular and important fashion element of the 60s in England; particularly the mod scene (Chelsea is a street in London where the name was derived). 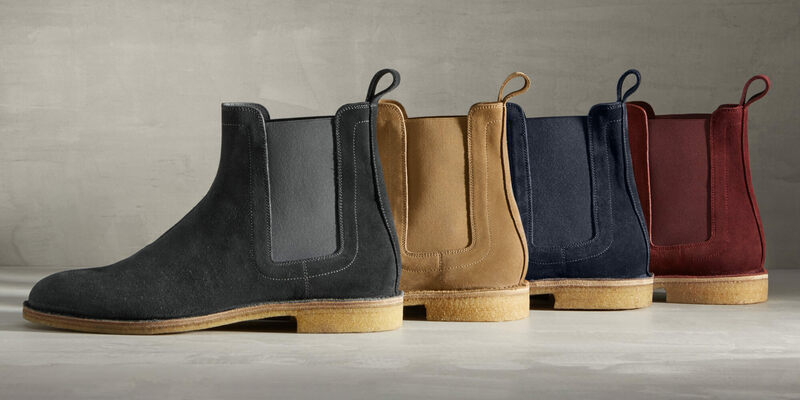 Undeniably, Chelsea boots are also one of the most versatile footwear any dude can have. If you are the type who wants something unique, comfortable, stylish, and class, then this is your choice. Check out this list of the top 10 best budget Chelsea boots for the man looking for an affordable option made with quality in mind. This ankle boot can get you through the day at work or simply a walk in town as it features a slim and sophisticated profile that compliments any look. It has no lace nor buttons that it slips onto the foot with ease. Made from suede, the boot is easy to clean and looks great on the feet with almost any ensemble together with its elongated and slightly pointed toe. The rubber sole provides a perfect amount of traction that sticks along the surface as you walk along. It has a tag at the back of its heel showing off a classic look. The shaft measures about 4.25 inches in height from the arch, providing comfortable coverage of the ankle while the platform of the shoe measures at least .25 inches and the heel is about one inch. Maintaining good-looking suede boots is quite difficult at times. With this pair of suede boots, upkeep is never a problem. These stylish ankle boots look great for any event. It features a spacious rounded toe, a light brown color with a rich, dark mocha brown in the center lining. The dark colored part is an elastic material which makes it simple for you to step into and out of. The boots have faux suede leather upper-part that is soft and comfortable. Also, the natural rubber sole helps keep the feet relaxed in any sort of weather. Along the ankle and the thin platform is a stitching that provides the boots a more intricately detailed look. Its slightly pointed toe, high ankle design and a heel give a classic boot silhouette that looks great in any kind of clothing, be it formal or something casual. Not so fond of bulky and clunky boot styles? This one is just right for you. This boot is durable and stylish. The toe part is wide and somewhat boxy, giving plenty of room for the feet to feel comfortable inside while having a slightly rounded top.It is ankle high and provides enough coverage without restricting natural movement. There is a dark brown elastic material inside it that gives sheer comfort large while the leather loop at the back of this ankle boots provide greater ease of slipping the feet into and out of the boot. The boot is covered with warm brown, full-grain leather that looks good with any type of attire. There is a slight heel of 1.25 inches and the shaft measures about 6 inches from the arch. Subtle in both color and in style, this boot is ideal for wear in both professional and semi-casual occasions. It comes in a rich brown color that easily matches the color of the attire you are wearing. A light brown trim and a beige stitching found at the platform of the boot give just a bit of detail and color. This product offers a classic look being made out of leather. A tall shaft sits just around the ankle, measuring around 5 inches from the arch. It has a flexible and comfortable rubber sole for providing plenty of traction and support. It has a breathable upper material in which helps prevent foot fatigue after just having worn it for sometime. The out-sole offers a unique non-marking design that won’t scuff up the floors or leave behind track marks on the ground. Considering the slim profile and sleek design, this item is great to wear at work or at play. It is ideal for anyone who enjoys the look and feel of leather. These boots are covered from top to bottom in high quality light tan leather that is easy to maintain. There is a large side gore panel on each boot that is dark in color and shows off a little detailed look. The shaft measures around 5 inches from the arch matching the perfect height of the ankle without restricting movement. A soft, printed fabric lining with a padded insole is found inside for total comfort and support. It is lightweight and will not cause fatigue when worn for only a few hours. The out-sole is durable and flexible while the rubber sole also provides excellent traction. Wanting to have a pair of boots that is stylish and comfortable yet durable? This product offers just that. It features a blend of leather and textiles that is heavy duty by nature. A synthetic sole supports the boot, provides comfort due to its air-cushioned design. This boot style features an ultra large finger loop and elastic gore panels on the sides for ease of sliding the foot in and out of it. These boots have shafts that measures around 5.75 inches from the arch to give the ankle support and coverage without having to worry about it restricting range of movement. The out-sole is durable and slip resistant to provide the most traction possible. It comes in a classic black color that makes it easy to pair with almost any attire. Stark black and daring, this is a boot that can be worn with any attire you may own. Ideal for both professional and semi-formal occasions that is made to fit into any lifestyle. Made out of striking leather and is easy to maintain, this boot will only look better with age. It has a tab at the back of the ankle and an inclusion of gore panels to have ease in slipping in and out of the boot. The opening measures around 10.25 inches while the shaft is about 5.75 inches from the arch. It has a synthetic sole that is comfortable and cozy without being too warm. The boot is lightweight and features a burnished toe. The out-sole is flexible for a comfortable step while also providing enough traction for support. Dont have the right pair of chelsea shoes to wear? This piece with a sleek gray color and ideal design is the answer to that. Made out of genuine suede leather, the boot is ultra soft and gorgeous to look at. The gray color is subtle and neutral which makes it easy to be paired with any ensembles. Because of the color and classic silhouette, they are great for wear in formal and semi – formal gatherings. It features a synthetic sole that is comfortable and flexible. Around the platform, there is decorative stitching that contrasts the gray shade of the shoe. The out-sole has a slight heel and is durable. This heel gives a classic Chelsea silhouette. A shaft measures around 5 inches from the arch while a tab at the back that makes it simple to step into and out of. The gore panels on the side also help the easy entry into the boot. For those who need a shoe to get through work while also looking great for a night in the town, then, this is the perfect choice. It is a sleek leather boot that is black in color. At the back is a tab for easily pulling the shoe on, while the gore paneling on the side furthers its ability to allow easy entry into and out of the shoe. The opening of the boot measures around 5.5 inches for total comfort while getting into and out of the boot, but also while wearing it. A shaft rises a comfortable distance of 10.25 inches from the arch to provide with just enough coverage. It has a rounded toe that makes it simple to get comfortable. The boot also comes with a slight heel that does not give too much of a lift but does provide a classic Chelsea style silhouette. These boots are every bit as comfortable as they are stylish. The light brown color can be matched with any casual, formal clothing or anywhere in between. Made out of a faux leather upper that offers comfort wherever you go. Its rounded toe provides enough space to move around. Also, it has a unique look that you love about Chelsea boots. The heel of the boot is accented, stacked yet is not too tall. Having a pull-tab on the heel makes it simple to pull the shoe onto your foot. The heel tab is accented by the elasticized panels at the sides of the shoe for proper fit. The out-soles are made with a flexible rubber that not only promises a more comfortable step but likewise offers enough traction and support. Inside, there is 100 percent polyester lining that makes up for an ultra comfortable interior that is just as soft as the leather exterior of the shoe.